With war threatening between the “great powers,” L. Ron Hubbard had just delivered the London Congress on Human Problems. There he had introduced the introductory service, the Personnel Efficiency Course, and had announced The Problems of Work as the course text. In his opening lecture, he conveyed both urgency and need: “Our mission, to a large degree, is an educational mission. And we have just recently learned that we have, contained in our subjects, the entirety of education.” Here, in the 15th ACC, is where he taught the application of simplicity, demonstrating its universal power whether in auditing, education or planetary dissemination. He trained auditors not only on how to audit, but how to communicate data and how to educate, introducing the precursors of Study Technology—Learning Processes—that sliced through complexities like a knife through butter. And given auditors would need organizational know‑how, they concurrently attended evening lectures for instruction on running Scientology groups—a series renowned today as Washington Lectures: Organization and Personnel Efficiency. In sum, Mr. Hubbard had taken a giant stride in outreach, and with ACC students primed for action on the front lines, he declared the 15th American ACC the most successful ever. As October 1956 arrived, crisis after crisis was enacting itself on the world stage. In July, Egypt’s President Nasser had seized the Suez Canal, a vital oil pipeline, and British and French forces were preparing to bomb Egyptian air bases. While in Cuba, a revolution brewed, setting the stage for a future US-Soviet confrontation that would bring the world to the brink of war. Knowing that without Scientology applied on a broad scale, no hope existed for any permanent resolution to planetary conflicts, L. Ron Hubbard turned his attention once again to the all-important task of dissemination. Earlier that year he had traveled to Dublin, Ireland, where he pioneered and codified the groundbreaking Personnel Efficiency Course. In the fall, he released two major books: Scientology: The Fundamentals of Thought and The Problems of Work—Scientology Applied to the Workaday World. Both texts provided the man in the street with a manual on Scientology basics that he could immediately apply to improve his own livingness and that of his family, friends and associates. Then, in the first week of October, Mr. Hubbard delivered the London Congress on Human Problems, again with its focus on the application of Scientology principles to resolve the entire gamut of human problems in all their apparent complexity. Returning to Washington, DC, he promptly set up larger quarters next to the Founding Church of Scientology and established new student housing nearby—personally directing all details, including furnishings and décor. With everything in place, and toward that same end of broad dissemination, Mr. Hubbard prepared to convene a very special ACC. Soon those veterans—notably including graduates of previous ACCs—were flooding Mr. Hubbard’s office with applications. For not only had his ACCs already acquired legendary status, but this was the first American ACC to be delivered by him since the 9th in Phoenix in December 1954. And the reason had everything to do with auditor application of all he had taught through previous Advanced Clinical Courses. Ever since the 1st ACC, Mr. Hubbard had focused on instilling the fundamentals of auditing into the bones of every student. But with a growing corps of able auditors, it was time to bring all that work to fruition. Consequently, immediately on completion of the 9th ACC, he had rolled out a distinctly different type of Advanced Clinical Course. Although instructed by others, it featured something then unprecedented. Instead of seeing and hearing him lecture, students saw and heard him audit. A special issue of Ability magazine banner-headlined the dramatic news: “CLINICAL COURSE ADVANCED!” Declaring that a major training breakthrough would finally offer an answer to a question long posed by auditors—“Just what does Ron do with a case that produces the results he produces?”—the article described how, with preclear agreement, a specially developed, state-of-the-art TV camera was placed out of sight in the auditing room, focused on both preclear and Mr. Hubbard. Yet this first use of closed-circuit TV was only one part of a three-pronged training approach. Next came the crucial phase of application, with ACC students finding their preclears among all strata of the community. Then, at Auditors’ Conferences held in Mr. Hubbard’s office, they reported what processes they had run and the exact results, with Mr. Hubbard delivering on-the-spot direction to be applied in the next sessions with their preclears. It was a program that not only lifted auditor training to a higher plateau, but, introducing communities to the miracles Scientology can accomplish, provided a platform for applying Scientology principles on a far broader scale. And now Mr. Hubbard was about to take these developments to a new level right in the nation’s capital. “Now, in view of the fact that a person is only auditable in the direction of more methods and more game, getting him back to a simplicity becomes the biggest trick that has been pulled since the construction of this universe. Ordinarily, if you just try to pull him back toward a simplicity straightly, you cost him all his game and he collapses. And that’s the end of the case, practically. Got it? To reinforce what simplicity truly represented in understanding cases, it was during this ACC that Mr. Hubbard delivered his immortal “The Story of a Static.” Later published as a Professional Auditor’s Bulletin, his seven-sentence masterpiece is not only vital technical data, but an enduring stable datum unraveling whole track complexity. Given the importance of these educational breakthroughs in the light of Mr. Hubbard’s later developments to improve educational standards both in the course room and throughout the entire society, he would henceforth refer to these lectures as marking the beginnings of Study Technology. Yet, training those key personnel to the required level of expertise definitely included instilling organizational basics—specifically, how to establish and expand groups that would act as dissemination points for Scientology, in turn creating other groups, generating exponential growth. Thus, concurrently with the ACC, he delivered a separate series of evening lectures in which he presented the basic principles of organization and in-depth instruction on setting up, administering and delivering a Personnel Efficiency Course. This historic series—additionally attended by all staff and Academy students of the Founding Church—would soon be renowned as the Washington Lectures: Organization & Personnel Efficiency. Cures—what they have to do with Alter-isness and how cures eventually require more cures. All of which is to say, it was an ACC that marked a giant stride forward in outreach, and in his farewell lecture of November 23, Mr. Hubbard attributed its success to the students’ preexisting command of fundamentals. Finally, in preparation for the liftoff toward expansion greater than any in history, he instructed his publisher to increase by five times print runs of Scientology: The Fundamentals of Thought, while moving forward with translation of this embracive text. 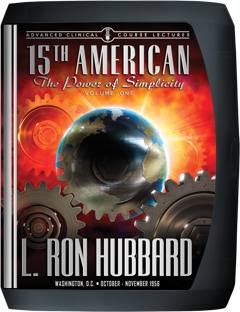 And at the same time, advancing in research from that embarkation point of simplicity, L. Ron Hubbard now stood on the edge of yet another breakthrough—an entirely new series of processes to crack even the most intractable of cases.